NORA consumer outreach exceeding expectations. An aggressive internet focused consumer outreach program extolling the virtues of heating with Bioheat® (heating oil blended with renewable biodiesel) has performed even better than anticipated. The National Oilheat Research Alliance (NORA), through its Board of Directors and Executive Committee, allocated nearly $1 million to ensure consumers understand the value of oilheating. This is being accomplished through a digital media outreach plan expected to lead to nearly 100 million impressions and more than 500,000 visits to NORA’s website OilheatAmerica.com. This effort ensures oilheating customers understand the true value of oilheat. The decade from 2004 through 2014 was one of the most challenging ever for the oilheating industry. Warm winters, high and volatile fuel prices and strong political and environmental movements against hydrocarbon fuels all converged to make a difficult time for both heating oil suppliers and consumers. Fortunately, the industry has been rewarded with a collapse in fuel prices- currently the lowest crude prices in 11 years. Additionally, through the leadership of NORA and numerous state and regional associations working with NORA, the industry has begun to transition to low-carbon and renewable fuels. The next step is to make sure oilheat customers aware of these important positive changes so they will know their loyalty to oilheat has been rewarded. The New York Oil Heating Association (NYOHA) is helping a teacher in Bronx, NY, incorporate clean-burning Bioheat® fuel as a teaching tool in an interdisciplinary approach to HVAC training. Oilheated homes can expect low fuel costs. Homeowners can expect lower heating prices both short and long-term. Homeowners who heat their houses with heating oil will see lower prices this winter and for the foreseeable future. Dramatic increases in production combined with ample and increasing inventories have driven the price of home heating oil down to levels not seen in years. During severe flood events, such as those occurring from Hurricane Irene and Super-Storm Sandy, many coastal and low elevation inland areas were subjected to high water conditions. As a result, a number of outdoor above-ground home heating oil tanks were dislodged and, in some cases, caused property damage. In response to the combined effects of these events, the Oil Heat Institute of Long Island (OHILI) and the National Oilheat Research Alliance (NORA), in collaboration with local government agencies and oil heat industry experts, have developed this Recommended Practice (RP) in an effort to mitigate these problems in future flood events. The research, testing and approval of this RP went through the National Fire Protection (NFPA) 31 Technical Committee and was balloted successfully for publication as a reference document. This RP should be used as guidance when installing new tanks or upgrading existing installations. Oilheat America, the leading source for information on the benefits of using heating oil for space and hot water heating, has expanded its public outreach efforts by launching new Facebook, Twitter, YouTube and Google+ pages. Internet-connected computer and mobile device users can visit and follow or subscribe to these pages by clicking the social media icons at OilheatAmerica.com. As with OilheatAmerica.com, social media updates will focus on Oilheat’s core attributes: Safe, Efficient, Clean, Abundant and Independent while including information on Bioheat®, the new “oilheat” containing a renewable biodiesel blend. Oilheat America’s social media pages will be updated with links to information found on the Oilheat America website. These updates will then be shared by followers and subscribers, as well as social media users who find them via friends’ timelines or boosted (sponsored) posts. Built to be friendly and accessible to the widest possible audience, the new social media platforms will connect Oilheat America with consumers, business owners, policymakers and anyone else who is interested in heating oil. Oilheat America looks to leverage the power of social media to spread knowledge of heating oil and to strengthen ongoing dialogues with the individuals who use it and the organizations that buy, sell and distribute it. Oilheat America was re-launched by NORA in January of 2015 and has shown spirited activity with three and a half thousand visitors to date. 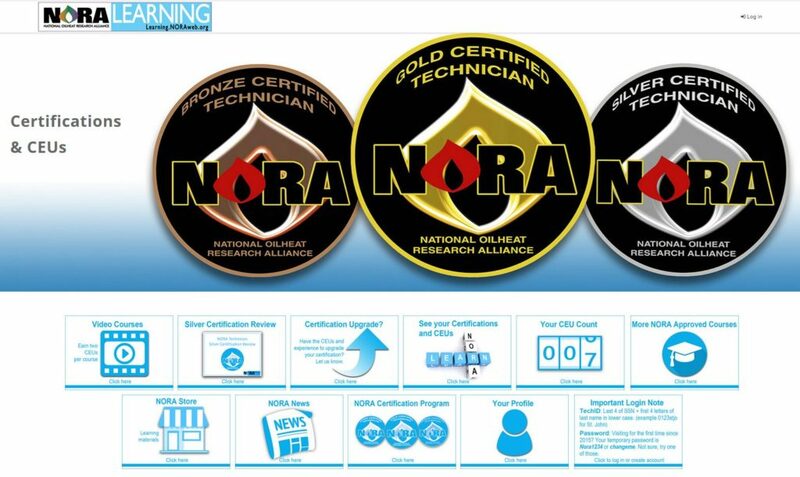 Oilheat America is sponsored by the National Oilheat Research Alliance (NORA). NORA was authorized by Congress in 2000 to generate funding allowing the Oilheating industry to provide more efficient and more reliable heat and hot water to American consumers. NORA’s efforts focus on Consumer Education, Professional Education, Energy Efficiency & Safety, and Research. For more information about NORA and its programs or services, call 703-340-1660 or visit the web site, NORAweb.org. The Northeastern states are moving steadily towards improving the characteristics of home heating oil. Through the reduction of sulfur to almost negligible levels, the new heating oil burns cleaner and service intervals on heating appliances can be extended, providing consumers with more efficient heating and fewer service calls. BioheatTM, the addition of biodiesel to heating oil, results in a exciting clean, carbon friendly fuel with a renewable component. The New England Fuel Institute has compiled a chart of where each of the major oilheating states in the Northeast stand on the transition. Pursuant to Public Law 113-79 (the Agricultural Act of 2014), Congress required NORA to prepare a report on the utilization rate and analysis of the use of biofuels in Oilheating equipment. The report titled, “Developing a Renewable Biofuel Option for the Home Heating Sector“ was released on May 13, 2015 and is most comprehensive report of its kind. Get the complete report here. One of the biggest transitions in heating oil has been the move to ultra-low sulfur heating oil (ULSHO). This fuel lowers maintenance, improves efficiency and reduces pollution from heating systems. Biodiesel blends at 20% (B-20) with ultra-low sulfur heating oil (ULSHO) are lower in Greenhouse Gas Emissions (GHG) than natural gas when evaluated over 100 years, while blends of 2% (B-2) or more are lower in GHG than natural gas when evaluated over twenty years. Biodiesel blended at 5 percent would require approximately 300 million gallons of biodiesel produced per year. Assuming the biodiesel industry average of 50 million gallons per year per plant. Bioheat® would be responsible for 6 plants built and continuously operated. Thus, nearly 270 full time jobs can be directly attributed to Bioheat®. Studies on the operation of Bioheat® on the basic burner operation with biodiesel blends at B-20 (at least) is the same as with unblended heating oil. NORA (the Alliance) and the National Biodiesel Board (NBB) have communicated the value of using biodiesel and selling Bioheat®. The Alliance features information about Bioheat® on its consumer website, OilheatAmerica.com. The NBB has a webpage, Bioheatonline.com that describes the advantages of Bioheat®. Further, the Alliance and its affiliated state associations have worked to provide education on this product to consumers and retail oil companies through the use of mass media and informational brochures. State and local governments have utilized a number of strategies to encourage the use of biofuels in their communities. It is often necessary to encourage its use with incentives or mandates to develop the infrastructure and overall market acceptance for a new fuel. Recognizing the importance of energy efficiency for both the US consumer and for the retail heating oil companies that service them, NORA is developing a new energy efficiency program. NORA’s commitment to energy efficiency is so strong that fifteen percent of NORA collections will be spent on the program. Clifton, NJ to review a select group of state energy programs. This review was recently completed and the report Understanding the Energy Efficiency Landscape, and Implications for NORA Initiatives has been issued. This report describes various existing state programs and reviews several particularly successful programs and their relationship to the retail oil dealers who are the backbone of NORA. The report’s primary recommendation for NORA is to facilitate the development of energy efficiency programs for retail service companies. This would provide companies an opportunity to provide additional services to their customers, improve their workforce and enhance energy efficiency. A NORA committee is now examining the types of materials that should be developed to facilitate this program. It should be noted that this report is not official NORA policy, but does provide guidance for moving forward in this critical area. The National Oilheat Research Alliance (NORA) launched a completely new version of OilheatAmerica.com, its consumer information website, on Tuesday, January 20, 2015. NORA, working with Primedia, identified the core attributes of Oilheat – Safe, Renewable, Efficient, Clean, Domestic, Abundant and Independent. New content was then created to explain each attribute and how it benefits the consumer. Designed and developed for today’s Internet user, the new site features a clean design, shorter copy, and a responsive design for ease and accessibility from mobile devices, smartphones and tablets as well as desktop and laptop computers. The wealth of valuable Oilheat information from the previous incarnation of OilheatAmerica was maintained in the expansive Knowledge Base section, including the FAQs and Equipment sections. New to the site are expanded information on Bioheat® Fuel and state mandates for ULSHO and biofuels, rotating “quick facts,” and sections developed specifically for Commercial and Industrial Users, Home Buyers and Sellers, Real Estate Professionals, Builders and HVAC Professionals, and Home Inspectors. NORA was authorized by Congress in 2000 to provide funding that would allow the Oilheating industry to provide more efficient and more reliable heat and hot water to the American consumer. The four key arms of NORA are Consumer Education, Professional Education, improving Energy Efficiency and Safety, and Research. Looking for the NORA Learning Center?